Algeria's magistrates threaten to boycott July presidential poll - The Maghreb Times ! 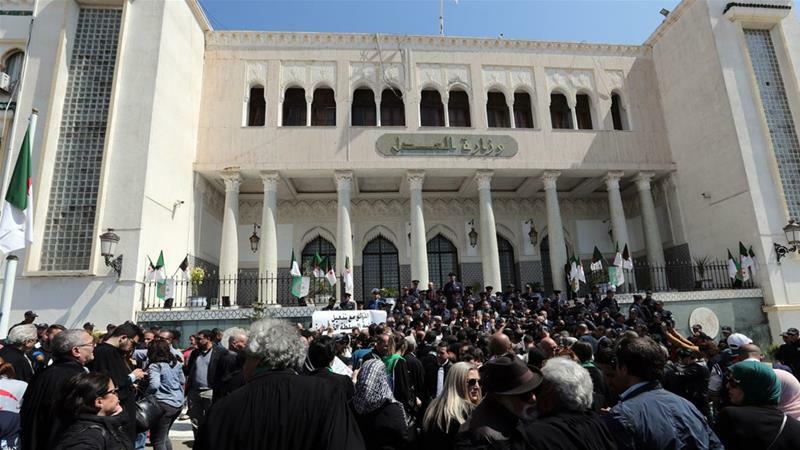 Algeria’s magistrates, who play a key role overseeing the country’s elections, said on Saturday they would boycott a July 4 presidential election in support of the protest movement. Protesters have held vast rallies calling for allies of overthrown president Abdelaziz Bouteflika to step down after the veteran leader resigned early this month. They have rejected the July poll, arguing that elections cannot be free and fair if they are held under the same judicial framework and institutions of the Bouteflika government. Interim leader Abdelkader Bensalah has pledged a “transparent” vote but protesters have called for him to leave office too. More than 100 magistrates staged a protest outside the justice ministry on Saturday in response to a call by the Magistrates’ Club – a nascent group set up as an alternative to the government’s National Magistrates’ Syndicate (SNM). Magistrates play a major role in organising votes in Algeria. Notably, they oversee the electoral roll, a frequent source of disputes between the regime and the opposition.